This week’s events mark the beginning of winter fun, with a ballet, musical, and blues showcase. 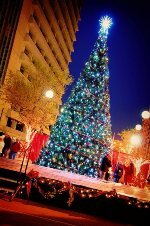 Oklahoma City’s Downtown in December Kick Off takes place on November 25th at 5:00 p.m. Oklahoma City Mayor Mick Cornett and Santa will light the SandRidge Christmas Tree. It is 32-feet tall and stands on the Bricktown Canal at Mickey Mantle Drive. Afterwards, the Groove Merchants perform, Santa will be available for pictures, and participants can make their own ornament. Other winter activities in December include ice skating, snow tubing, and water taxi rides. The Norman Ballet Company presents “The Oklahoma Nutcracker” November 25th through the 27th at the Nancy O'Brian Center for the Performing Arts. This year is “The Oklahoma Nutcracker” 10th anniversary. The Norman Ballet’s rendition of Tchaikovsky’s score maintains the storyline, but includes elements of Oklahoma history and natural resources. Before the November 27th show, the Sand Plum Fairy Tea Party takes place in the Studio Theatre at 1:00 p.m. The Sand Plum Fairy, Santa Clause, and the Nutcracker will make special appearances. The Sooner Theatre opens “Joseph and the Amazing Technicolor Dreamcoat” November 25th at 7:30 p.m. The musical retelling of the biblical story of Joseph and the coat of many colors was composed by Andrew Lloyd Webber with lyrics by Tim Rice. The cast performs various musical styles, ranging from country and western to calypso. What began as a 15-minute pop cantata and concept album in the late 60s has now been performed by over 20,000 schools and theatre groups. “Joseph and the Amazing Technicolor Dreamcoat” runs through December 11th. Lansbrook Event Center in Oklahoma City hosts The Big Blues Show and Dance on November 25th starting at 8:00 p.m. Musicians featured on the bill include Garrett “Big J” Jacobson, “Mr. Guitar” Kelvin Drake, Tony Gains, Mr. Harold Jefferson, Morris McCraven, and Oklahoma Blues Hall of Fame inductee “Sir James” James Walker Sr.
On Thursday, November 24th, Camille Harp and The Damn Quails will be performing a Thanksgiving Day show at The Deli in Norman. The concert begins at 7:00 p.m. with Camille Harp, and The Damn Quails take the stage at 10:00 p.m. Click here for an audio showcase of The Damn Quails at KGOU. Other events of interest are the 7th Annual Devon Energy Holiday River Parade and the opening of "The Fox on the Fairway" at Carpenter Square Theatre in Oklahoma City. For more events or details, visit our calendar page.